Why Does This Blog Exist? What Is Its Purpose? I have been asked the question.... WHY? Why am I writing this blog, and who will it benefit? Actually the question was "Why am I writing this blog since George W. Bush is out of office?" Just because George W. is no longer an acting President of the United States, that alone doesn't make anything he did in the past that may have been considered wrong - right, nor does that fact forgive him. It's not because I am a Democrat and he is a Republican President. After all, I voted for him the first time, but watched him destroy the country a little at a time. Then his acts of torture, a method called water-boarding. The country is suffering because of his actions, the economy destroyed because of him, lives and property lost because of him, peoples savings lost because of him. People have a right to know, not just to believe everything George W. says. People don't even have to believe what I say. They can believe who they like. 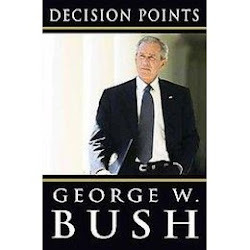 But, for example, after publishing his book, Bush told the press that he will be dead and gone before the people of the world finally understand what he had done in office. That is the main reason why my blog needs to be written - NOW !! Even that, I truly believe that many things that he has done will be classified as 'secret and confidential' and may never come to light. The childish response by the 43rd President of the United States almost 3 years to the day is the mark of an irresponsible president who seems to have no concern for what he says. He got away with threatening the United States with the proof in the article below, even though it is considered a 'slip of the tongue' during a speech, and obviously he did not mean it. But, if you or I would have said something like that, most likely we could and would be arrested. He was above the law then, and is above the law now. It seems that the same laws that applies to him does not apply to the citizens he was supposed to represent. Thank God he doesn't represent us now!! 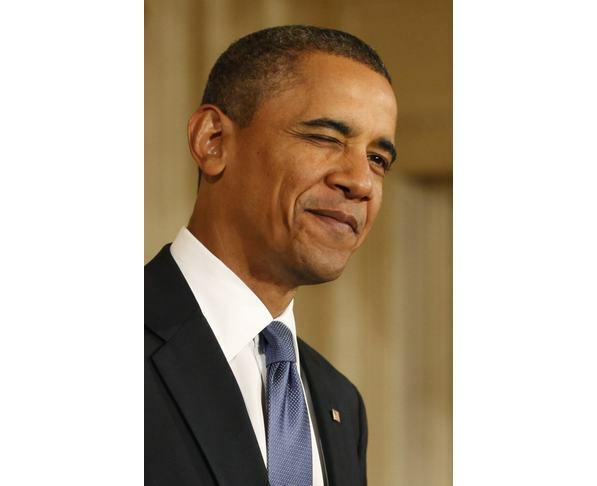 Another reason why I write this blog because it is a fact that most people of the United States, an overwhelming number believe that the economic mess we are in today is because of him, and a considerable less number of people believe that President Obama is at fault. The facts are the facts. He started 2 wars and passed the responsibility to Barack Obama. He is responsible for the deaths of every American in both Iraq and Afghanistan. He started a war that should have never been started in the first place. After all, there were no weapons of mass destruction, and he knew it. There is evidence to prove it. He knew about the threats to U.S. soil just days before 911, but he did not act. He witnessed as did the world, the destruction of a prominent U.S. City, New Orleans in the aftermath of Hurricane Katrina, and what did he do... Nothing. Pictures of him looking out of an airplane, stairing down at the city of New Orleans is damning evidence that he did nothing. He didn't want to land. He even admits that fault, but just because he acknowledges it, doesn't make it ok to forgive him. You can only speculate that the reason why is because he faired for his safety. But after all, his ego tells him that his life is worth more that the people trapped in the floods, standing on top of their houses because they were trapped by flood waters. He believed that he was better than them. Of course, every sitting President deserves the respect of everyone, but in my mind he never really deserved respect. That's the reason why I have so little respect for him now. So far, the freedom of speech and the freedom of the press protect me as I write this blog, and I am proud to be able to do so. Only in a country such as this can you speak and write freely, as long as you pose no bodily harm to someone. The picture tells it all. 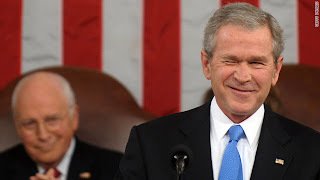 President George W. winks during his very last State of the Union address on January 28, 2008. Why did he wink? Is it truly a wink or a twitch.. Actually is is a purposeful wink. 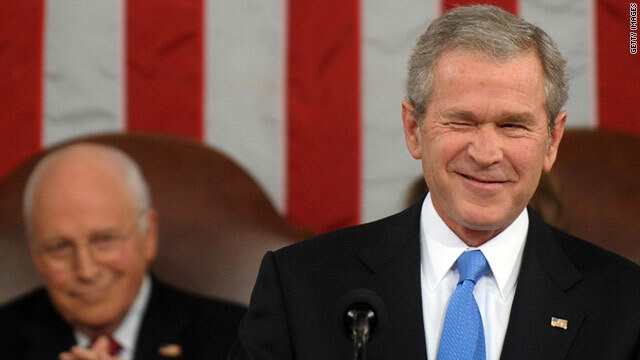 George W. has winked several times during his speeches throughout his tenure as President. Ok, now let's be honest and fair. President Obama winks too. Check this out.. Concerning George W, of real concern would be his ability to give a speech. It is beyond my imagination to know that George W. served as President for two terms, when he really wasn't capable of giving out one speech without messing it up somewhere. Nobody's perfect, including President Obama who has also slipped up in a few speeches from time to time, but what you have here is the President of the United States with a failure to communicate and gets away with threatening the United States. Watch the following video to see what I mean. Check out the priceless look on Rumsfeld's face when George W. made a mistake in his speech. This is what he actually said.. Referring to the country's enemies, Bush said in his characteristic third-grade manner, "Our enemies are innovative and resourceful, and so are we, "They never stop thinking about new ways to harm our country and our people, and neither do we." Who in the heck proof-read his speech.. Obviously, George W. never checked it out before reading it.